Neck pain is a common reason people visit their doctor. Neck pain typically doesn't start from a single injury. Instead, the problem usually develops over time from the stress and strain of daily activities. Eventually, the parts of the spine begin to degenerate. The degeneration can become a source of neck pain. Knowing how your neck normally works and why you feel pain are important in helping you care for your neck problem. Patients are often less anxious and more satisfied with their care when they have the information they need to make the best decisions about their condition. What parts make up the cervical spine, and how do they work? The cervical spine is formed by the first seven vertebrae. Doctors often refer to these vertebrae as C1 to C7. The cervical spine starts where the top vertebra (C1) connects to the bottom edge of the skull. The cervical spine curves slightly inward and ends where C7 joins the top of the thoracic spine. This is where the chest begins. Each vertebra is formed by a round block of bone, called a vertebral body. A bony ring attaches to the back of the vertebral body. When the vertebrae are stacked on top of each other, the rings form a hollow tube. This bony tube surrounds the spinal cord as it passes through the spine. Just as the skull protects the brain, the bones of the spinal column protect the spinal cord. As the spinal cord travels from the brain down through the spine, it sends out nerve branches between each vertebrae called nerve roots. These nerve roots join together to form the nerves that travel throughout the body and form the body's electrical system. The nerve roots that come out of the cervical spine form the nerves that go to the arms and hands. The thoracic spine nerves go to the abdomen and chest. The nerves coming out of the lumbar (lower) spine go to the organs of the pelvis, the legs, and the feet. One way to understand the anatomy of the cervical spine to look at a spinal segment. Each spinal segment includes two vertebrae separated by an intervertebral disc, the nerves that leave the spinal cord at that level, and the small facet joints (described later) that link each level of the spinal column. An intervertebral disc is made of connective tissue. Connective tissue is the material that holds the living cells of the body together. Most connective tissue is made of fibers of a material called collagen. In some cases, the collagen fibers join together to form a structure like a rope. In other cases, the fibers are arranged like a piece of cloth, or knitted materials such as you find in a sweater. The disc is a specialized connective tissue structure that separates the two vertebral bodies of the spinal segment. The disc normally works like a shock absorber. It protects the spine against the daily pull of gravity. It also protects the spine during activities that put strong force on the spine, such as jumping, running, and lifting. There are two facet joints between each pair of vertebrae, one on each side of the spine. A facet joint is made up of small, bony knobs that line up along the back of the spine. Where these knobs meet, they form a joint that connects the two vertebrae. The alignment of the facet joints of the cervical spine allows freedom of movement as you bend and turn your neck. There are many causes of neck pain. Doctors are not always able to pinpoint the source of a patient's pain. Your doctor will make every effort to ensure that your symptoms are not from a serious medical cause, such as cancer or a spinal infection. Below is a brief overview of some of the most common causes of neck pain. Most neck problems happen after years of wear and tear on the parts of the cervical spine. At first, these small injuries are not painful. But over time they can add up. Eventually they begin to cause neck pain. Doctors sometimes call these degenerative changes in the spine spondylosis. Spondylosis can affect the bones and soft tissues of the spine. However, it is important to know that most problems with spondylosis are a normal part of aging. The normal aging process involves changes within the intervertebral discs. Repeated stresses and strains weaken the connective tissues that make up a disc. Over time, the nucleus in the center of the disc dries out. When this happens, it loses some of its ability to absorb shock. The annulus also weakens and develops small cracks and tears. Often these changes are not painful. But larger tears that reach to the outer edge of the annulus can cause neck pain. The body tries to heal the cracks with scar tissue. But scar tissue is not as strong as the tissue it replaces. At some point the disc may finally lose its ability to absorb shock for the spine. Then forces from gravity and daily activities can take even more of a toll on the disc and other structures of the spine. 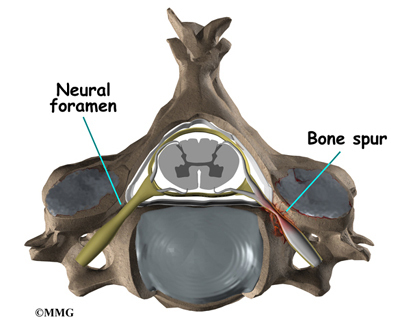 As the disc continues to degenerate, the space between the vertebrae becomes smaller. This compresses the facet joints along the back of the spinal column. As these joints are forced together, extra pressure builds on the articular cartilage on the surface of the facet joints. This extra pressure can damage the facet joints. Over time, this may lead to arthritis in the facet joints. These degenerative changes in the disc, facet joints, and ligaments cause the spinal segment to become loose and unstable. The extra movement causes even more wear and tear on the spine. As a result, more and larger tears occur in the annulus. The nucleus may push through the weakened and torn annulus and into the spinal canal. This is called a herniated or ruptured disc. The disc material that squeezes out can press against the spinal nerves. The disc also emits enzymes and chemicals that produce inflammation. The combination of pressure on the nerves and inflammation caused by the chemicals released from the disc cause pain. As the degeneration continues, bone spurs develop around the facet joints and around the disc. No one knows exactly why these bone spurs develop. Most doctors think that bone spurs are the body's attempt to stop the extra motion between the spinal segment. These bone spurs can cause problems by pressing on the nerves of the spine where they pass through the neural foramina. This pressure around the irritated nerve roots can cause pain, numbness, and weakness in the neck, arms, and hands. 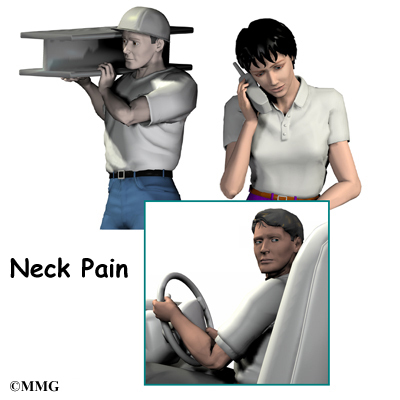 Mechanical neck pain is caused by wear and tear on the parts of the neck. It is similar in nature to a machine that begins to wear out. Mechanical pain usually starts from degenerative changes in the disc. As the disc starts to collapse, the space between the vertebrae narrows, and the facet joints may become inflamed. The pain is usually chronic. (Chronic pain builds over time and is long-lasting.) The pain is typically felt in the neck, but it may spread from the neck into the upper back or to the outside of the shoulder. Mechanical neck pain usually doesn't cause weakness or numbness in the arm or hand, because the problem is not from pressure on the spinal nerves. Pressure or irritation in the nerves of the cervical spine can affect the nerves' electrical signals. The pressure or irritation can be felt as numbness on the skin, weakness in the muscles, or pain along the path of the nerve. Most people think of these symptoms as indications of a pinched nerve. Health care providers call this condition cervical radiculopathy. 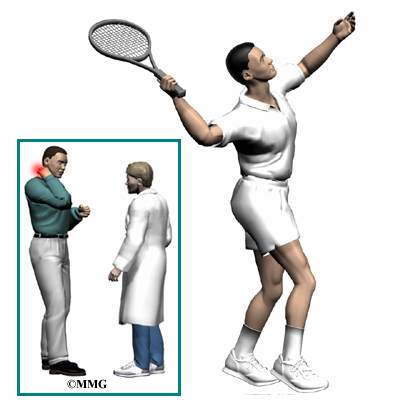 Several conditions can cause radiculopathy. The most common are degeneration, disc herniation, and spinal instability. Degeneration: As the spine ages, several changes occur in the bones and soft tissues. The disc loses its water content and begins to collapse, causing the space between the vertebrae to narrow. The added pressure may irritate and inflame the facet joints, causing them to become enlarged. When this happens, the enlarged joints can press against the nerves going to the arm as they squeeze through the neural foramina. Degeneration can also cause bone spurs to develop. Bone spurs may put pressure on nerves and produce symptoms of cervical radiculopathy. Herniated Disc: Heavy, repetitive bending, twisting, and lifting can place extra pressure on the shock-absorbing nucleus of the disc. If great enough, this increased pressure can injure the annulus (the tough, outer ring of the disc). If the annulus ruptures or tears, the material in the nucleus can squeeze out of the disc. This is called a herniation. Although daily activities may cause the nucleus to press against the annulus, the body is normally able to withstand these pressures. However, as the annulus ages, it tends to crack and tear. It is repaired with scar tissue. Over time, the annulus becomes weakened, and the disc can more easily herniate through the damaged annulus. Spinal Instability: Spinal instability means there is extra movement among the bones of the spine. Instability in the cervical spine can develop if the supporting ligaments have been stretched or torn from a severe injury to the head or neck. People with diseases that loosen their connective tissue may also have spinal instability. Spinal instability also includes conditions in which a vertebral body slips over the one just below it. When the vertebral body slips too far forward, the condition is called spondylolisthesis. Whatever the cause, extra movement in the bones of the spine can irritate or put pressure on the nerves of the neck, causing symptoms. Stenosis means closed in. Spinal stenosis refers to a condition in which the spinal cord is closed in, or compressed, inside the tube of the spinal canal. Spinal stenosis may be caused by degenerative changes, such as bone spurs pushing against the spinal cord within the spinal canal. However, stenosis can also develop when a person of any age has a disc herniation that pushes against the spinal canal. When the spinal cord is squeezed in the neck, doctors call the condition cervical myelopathy. This is an alarming condition that demands medical attention. Cervical myelopathy can cause problems with the bowels and bladder, change the way you walk, and affect your ability to use your fingers and hand. What are some of the symptoms of neck problems? How will my doctor find out what is causing my problem? The diagnosis of neck problems begins with a thorough history of your condition. You might be asked to fill out a questionnaire describing your neck problems. Then your doctor will ask you questions to find out when you first started having problems, what makes your symptoms worse or better, and how the symptoms affect your daily activity. Your answers will help guide the physical examination. X-rays show problems with bones, such as infection, bone tumors, or fractures. X-rays of the spine also can give your doctor information about how much degeneration has occurred in the spine, by showing the amount of space in the neural foramina and between the discs. X-rays are usually the first test ordered before any of the more specialized tests. Special X-rays called flexion and extension X-rays may help to determine if there is instability between vertebrae. These X-rays are taken from the side as you lean as far forward and then as far backward as you can. Comparing the two X-rays allows the doctor to see how much motion occurs between each spinal segment. 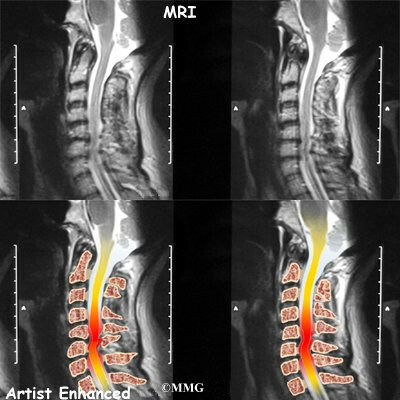 The magnetic resonance imaging (MRI) scan uses magnetic waves to create pictures of the cervical spine in slices. The MRI scan shows the cervical spine bones, as well as the soft tissue structures such as the discs, joints, and nerves. MRI scans are painless and don't require needles or dye. The MRI scan has become the most common test to look at the cervical spine after X-rays have been taken. The computed tomography (CT) scan is a special type of X-ray that lets doctors see slices of bone tissue. The machine uses a computer and X-rays to create these slices. It is used primarily when problems are suspected in the bones. The myelogram is a special kind of X-ray test where a special dye is injected into the spinal sac. The dye shows up on an X-ray. It helps a doctor see if there is a herniated disc, pressure on the spinal cord or spinal nerves, or a spinal tumor. Before the CT scan and the MRI scan were developed, the myelogram was the only test that doctors had to look for a herniated disc. The myelogram is still used today but not nearly as often. The myelogram is usually combined with CT scan to give more detail. A bone scan is a special test where radioactive tracers are injected into your blood stream. The tracers then show up on special X-rays of your neck. The tracers build up in areas where bone is undergoing a rapid repair process, such as a healing fracture or the area surrounding an infection or tumor. Usually the bone scan is used to locate the problem, and other tests such as the CT scan or MRI scan are then used to look at the area in detail. Your doctor may also ask you to have other tests done. An electromyogram (EMG) is a special test used to determine if there are problems with any of the nerves going to the upper limbs. EMGs are usually done to determine whether the nerve roots have been pinched by a herniated disc. During the test, small needles are placed into certain muscles that are supplied by each nerve root. If there has been a change in the function of the nerve, the muscle will send off different types of electrical signals. The EMG test reads these signals and can help determine which nerve root is involved. Not all causes of neck pain are from degenerative conditions. Doctors use blood tests to identify other conditions, such as arthritis or infection. Other tests may be needed to rule out problems that do not involve the spine. What can be done to relieve my symptoms? Your health care providers will work with you to improve your neck movement and strength. They will also encourage healthy body alignment and posture. These steps are designed to slow the degeneration process and enable you to get back to your normal activities. Many different types of medications are typically prescribed to help gain control of the symptoms of neck pain. There is no medication that will cure neck pain. Your doctor may prescribe medications to ease pain, fight inflammation, and to help you get a better night's sleep. If your pain is severe, your doctor may recommend a soft neck collar to keep your neck still for short periods of time. Resting the muscles and joints can help calm pain, inflammation, and muscle spasm. You might also be advised to place a cold pack on your neck for 10 to 15 minutes at a time, or you may be shown how to do a contrast treatment. Contrast treatments involve switching between a cold pack and a hot pack. Some doctors ask their patients to work with a physical therapist. Therapy treatments focus on relieving pain, improving neck movement, and fostering healthy posture. A therapist can design a rehabilitation program to address your particular condition and to help you prevent future problems. Spinal injections are used for both treatment and diagnostic purposes. There are several different types of spinal injections that your doctor may suggest. These injections usually use a mixture of an anesthetic and some type of cortisone preparation. The anesthetic is a medication that numbs the area where it is injected. If the injection takes away your pain immediately, this gives your doctor important information suggesting that the injected area is indeed the source of your pain. The cortisone decreases inflammation and can reduce the pain from an inflammed nerve or joint for a prolonged period of time. Some injections are more difficult to perform and require the use of a fluoroscope. A fluoroscope is a special type of X-ray that allows the doctor to see an X-ray picture continuously on a TV screen. The fluoroscope is used to guide the needle into the correct place before the injection is given. Epidural Steroid Injection: Neck pain or pain that spreads down the arm may require treatment with an epidural steroid injection (ESI). In an ESI, the medication mixture is injected into the epidural space around the nerve roots. Generally, an ESI is given only when other nonoperative treatments aren't working. ESIs are not always successful in relieving pain. If they do work, they may only provide temporary relief. Selective Nerve Root Injection: Another type of injection to place steroid medication around a specific inflamed nerve root is called a selective nerve root injection. The fluoroscope is used to guide a needle directly to the painful spinal nerve. The nerve root is then bathed with the medication. Some doctors believe this procedure gets more medication to the painful spot. In difficult cases, the selective nerve root injection can also help surgeons decide which nerve root is causing the problem before surgery is planned. Facet Joint Injection: When the problem is thought to be in the facet joints, an injection into one or more facet joints can help determine which joints are causing the problem and ease the pain as well. The fluoroscope is used to guide a needle directly into the facet joint. The facet joint is then filled with medication mixture. If the injection immediately eases the pain, it helps confirm that the facet joint is a source of pain. The steroid medication will reduce the inflammation in the joint over a period of days and may reduce or eliminate your neck pain. Trigger Point Injections: Injections of anesthetic medications mixed with a cortisone medication are sometimes given in the muscles, ligaments, or other soft tissues near the spine. These injections are called trigger point injections. These injections can help relieve neck pain and ease muscle spasm and tender points in the neck muscles. Only rarely is cervical spine surgery scheduled immediately. Your doctor may suggest immediate surgery if there are signs of pressure developing on the spinal cord or if your muscles are becoming weaker very rapidly. For other conditions, doctors prefer to try nonsurgical treatments for a minimum of three months before considering surgical options. Most people with neck pain tend to get better, not worse. Even people who have degenerative spine changes tend to gradually improve with time. Surgery may be suggested when severe pain is not improving. There are many different operations for neck pain. The goal of nearly all spine operations is to remove pressure from the nerves of the spine, to stop excessive motion between two or more vertebrae, or both. The type of surgery that is best depends on the patient's conditions and symptoms. A foraminotomy is done to open up the neural foramen and relieve pressure on a spinal nerve root. A foraminotomy may be done because of bone spurs or inflammation. The lamina is the covering layer of the bony ring of the spinal canal. It forms a roof-like structure over the back of the spinal cord. When the nerves in the spinal canal are being squeezed by a herniated disc or from bone spurs pushing into the canal, a laminectomy removes part or all of the lamina to release pressure on the spinal cord. In a discectomy, the surgeon removes a problem disc. Surgeons usually do this surgery from the front of the neck. This procedure is called anterior cervical discectomy. In most patients, discectomy is done together with a procedure called cervical fusion (described next). A fusion surgery joins two or more bones into one solid bone. The purpose for doing spinal fusion is to increase the space between the vertebrae and to keep the sore joint from moving. This is usually done by placing a small block of bone graft in the space where a disc was removed. Opening up more space enlarges the neural foramen, takes pressure off the nerve roots, and eases tension on the facet joints. Cervical fusion is used to treat neck problems such as cervical radiculopathy, disc herniations, fractures, and spinal instability. There are two main types of fusion for neck problems. Anterior Discectomy and Fusion: Anterior discectomy and fusion is done through the front of the neck. After taking out the disc (discectomy), the disc space is filled with a small graft of bone. The bone is allowed to heal, fusing the two vertebrae into one solid bone. Posterior Fusion: In posterior fusion, the surgeon lays small grafts of bone over the back of the spine. When these bones heal together, they fuse the two vertebrae into one solid bone. Posterior fusions in the cervical spine are primarily used to treat fractures of the neck. The bone graft needs time to heal in order for the fusion to succeed. This requires the neck to be held still. After cervical fusion surgery, patients usually have to wear a special neck brace for several months. These neck braces are often bulky and restrictive. Recently, surgeons have begun using metal plates and screws (often referred to as instrumentation) to lock the bones in place. The instrumentation is fastened to the vertebrae, where it holds the bones still while the graft heals. A corpectomy relieves pressure over a large part of the spinal cord. In this procedure, the surgeon takes off the front part of the spinal column and removes several vertebral bodies. The spaces are then filled with bone graft material. Metal plates and screws are generally used to hold the spine in place while it heals. A corpectomy is used in cases of severe spinal stenosis and myelopathy. Nonsurgical treatments can maximize the health of your neck and prolong the time before some type of surgery is needed. Physical therapy treatment is often prescribed for two to four weeks for patients with neck pain. Treatments are designed to help ease pain and to improve mobility, strength, posture, and function. Therapy treatments will teach you how to control your symptoms and protect your neck in the years ahead. You may be given exercises to do on a regular basis. Rehabilitation after surgery is much more complex. Some patients leave the hospital shortly after surgery, but some surgeries require patients to stay in the hospital for a few days. Patients who stay in the hospital may visit with a physical therapist in the hospital room soon after surgery. The treatment sessions help patients learn to move and do routine activities without putting extra strain on the neck. Many surgical patients need physical therapy outside of the hospital as well. They often see a therapist for one to three months, depending on the type of surgery. Therapy treatments are designed to calm pain and muscle spasm, teach patients to move safely, and help patients develop strength and mobility. As the therapy sessions come to an end, the therapist may help the patient get back to work. The therapist can do a work assessment to ensure the patient can do his or her job safely. Some patients may need to modify their work or other activities to avoid future problems.